The Baldwin Locomotive Works was founded in 1831 by Matthias Baldwin. The original plant was on Broad Street in Philadelphia, PA where the company did business for 71 years until it moved in 1912 to a new plant in Eddystone. Various partnerships during this period resulted in a number of name changes. It was known as Baldwin, Vail & Hufty (1839-1842); Baldwin & Whitney (1842-1845); M. W. Baldwin (1846-1853); and M. W. Baldwin & Co. (1854-1866). After Baldwin's death in 1866, the firm was known as M. Baird & Co. (1867-1873); Burnham, Parry, Williams & Co. (1873-1890); Burnham, Williams & Co. (1891-1909); it was finally incorporated as the Baldwin Locomotive Works in 1909. Westinghouse Corporation bought Baldwin in 1948. In 1950 the Lima-Hamilton Corporation and Baldwin merged. In 1956 the last of some 70,541 locomotives was produced. 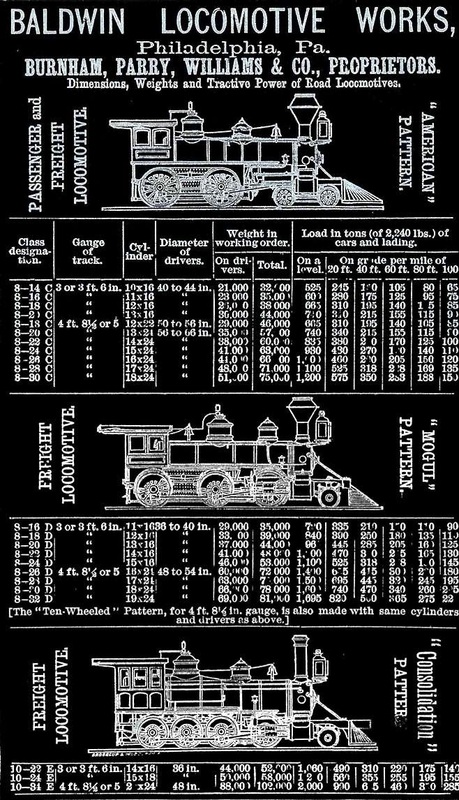 This page describes the 8 Williams and Co (later Baldwin Locomotive Works) 2-8-0 narrow gauge Consolidations purchased by DSP&P in 1880. 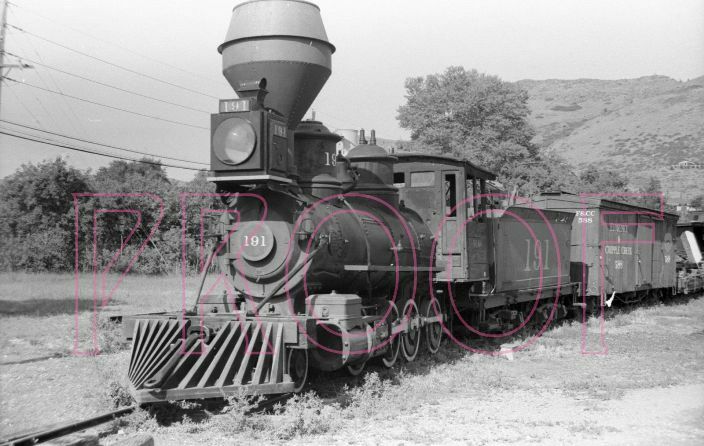 The Baldwin 2-8-0's became DSP&P #190 to 197 in 1885 amd C&S #30 to 36 in 1899 (old number 53 didn't make it to 1899). 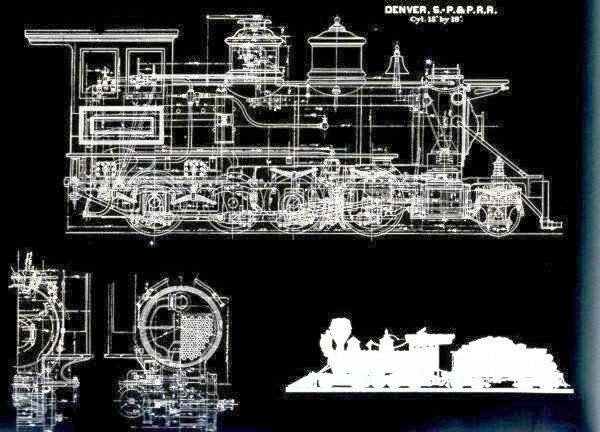 These numbers precede the numbers assigned to the Cooke 2-8-0's DSP&P #198 to 217. They had 37" drivers and 15x18" cylinders. 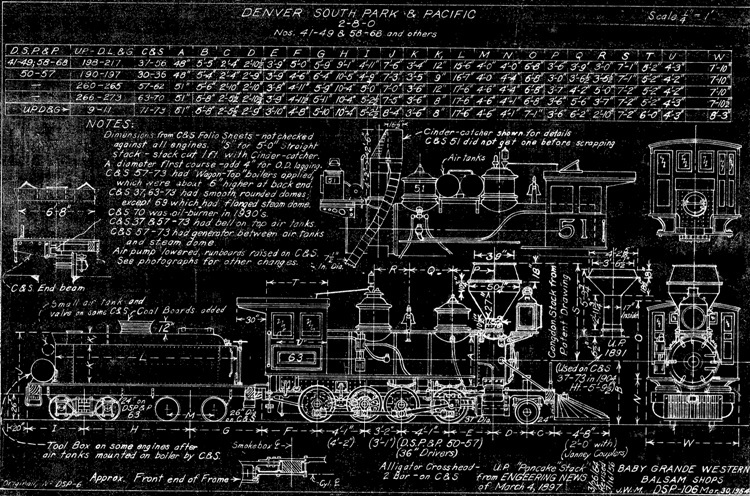 According to John Maxwell's plan, based on C&S folios and measured locomotives of the C&S era, all other dimensions are nearly identical to the Cooke 2-8-0s. This John Maxwell Plan has dimensions for both Baldwin and Cooke 2-8-0 Consolidations.